Sybase PowerBuilder IS .NET... and so much MORE! Posted on July 11, 2011, 11:29 am, by Tom Slee, Senior Product Manager, under Uncategorized. SQL Anywhere supports HTTPS synchronization for secure transmission of data over public networks. If you are setting this up in your application, you need to have a certificate on your device that either matches a server identity (in the case of a self-signed certificate) or which is provided by a certificate authority that the MobiLink server recognizes. The HTTPS implementation on Android uses the OpenSSL library, which has slightly different behavior to the Certicom libraries that SQL Anywhere uses on other platforms. So here are some pointers on getting HTTPS synchronization to work on Android. You may already have a certificate signing mechanism set up, so you may not need this stage, but if you don’t then you can use the SQL Anywhere createcert command-line utility to create the certificates that you need. Here are two ways of creating certificates that can be used on Android. Here is a createcert session to generate a self-signed certificate with the needed properties. The responses that I typed in are bold. Obviously the particular entries for country code and so on would be different in each case, but do notice the non-default key usage entry of 3,4,5,6 , which is required for this to work. 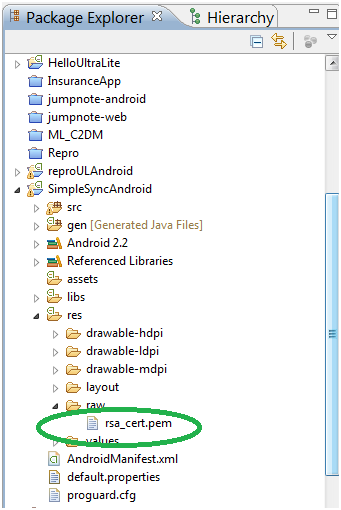 The generated files get used by the server (identity.pem) and by the client (rsa_cert.pem), as shown below. But first, let’s show an alternative way to generate certificates, this time using a certificate authority. You may use a certificate from an authority such as Verisign, but here is a sample for creating your own authority, and an identity from it, using createcert. You need to run createcert twice; once to create the certificate authority and once to generate an identity file from it. If you are using an external authority you can skip the first session. Here is a MobiLink server command line that uses the identity file identity.pem (for either setup). Here is a synchronization profile that you can use at the client side, which needs access to the certificate (rsa_cert.pem). I use this for testing synchronization from Interactive SQL without needing to build an application. The statement is split across several lines for readability. First, you need to be sure that you include the encryption library in your project. I posted about the basic setup for an UltraLite Android project here, and all you need different is to make sure that libmlcsra12.so (from the UltraLite\UltraLiteJ\Android\ARM subdirectory of your SQL Anywhere install) is in the libs\armeabi folder of your Android project. This adds the certificate to the files folder of your application’s private storage area, which is /data/data/<package-name>. And here is the code to synchronize, reading the certificate and passing it to the synchronization function. So that describes how to create certificates for HTTPS synchronization on Android, how to use them at the server, and how to use them at the client. « How Long Does a Sync Take? Welcome to Wandering Data, where we discuss Sybase mobile database technology – especially the UltraLite database and MobiLink synchronization server that are part of SQL Anywhere. We provide tips and tricks on using these technologies, mobile industry trends, important events and more. How Long Does a Sync Take? Disclaimer: The individuals who post here work at Sybase. The opinions expressed here are their own and do not necessarily reflect the views of the company.